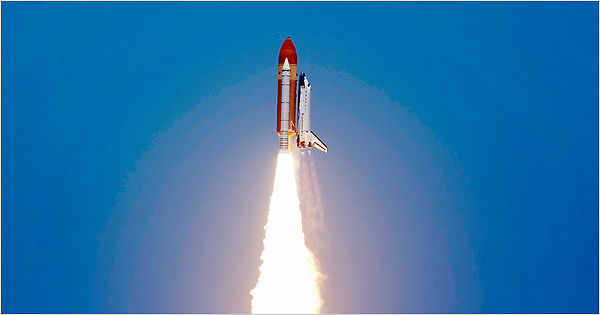 The Space Shuttle Atlantis lifts off on it last voyage?……. The space shuttle Atlantis, carrying a crew of six, a Russian docking module and critical spare parts, vaulted into orbit Friday on a 12-day space station assembly mission, the orbiter’s 32nd and final planned flight after a quarter century of service. With NASA bracing for the looming retirement of the shuttle fleet after a final three missions, Atlantis roared to life and rocketed away from its seaside pad at 2:20 p.m. Eastern time. The eight-and-a-half-minute ascent appeared normal as the spacecraft climbed through a partly cloudy sky, putting on a familiar, soon-to-be-missed show for area residents and tourists who turned out in droves to catch a glimpse of Atlantis’s final launching. A camera mounted on the shuttle’s external tank provided dramatic views of the climb to space with no obvious signs of foam insulation or other debris that might have caused any damage. Strapped in on Atlantis’s flight deck were Capt. Kenneth T. Ham of the Navy, the commander; Cmdr. Dominic A. Antonelli, also of the Navy, the pilot; the flight engineer, Michael T. Good, a retired Air Force colonel; and Garrett E. Reisman, veteran of a three-month stay aboard the space station in 2008. Seated on the shuttle’s lower deck were Capt. Stephen G. Bowen of the Navy, a former submariner, and Piers J. Sellers, a British-born astronaut who arranged to carry a piece of bark from Isaac Newton’s apple tree into the weightlessness of space. All six astronauts are shuttle veterans. If all goes well, Captain Ham will guide Atlantis to a docking with the forward port of the International Space Station early Sunday, kicking off a busy week of assembly work. The day after docking, Captain Bowen and Mr. Reisman plan to stage a six-and-a-half-hour spacewalk to install a spare Ku-band dish antenna and to mount an equipment stowage platform on a Canadian robot arm extension. The next day, Mr. Reisman, operating the station arm from inside the station’s new multiwindow cupola, will attach the 17,760-pound Rassvetmodule to the Earth-facing port of the central Russian Zarya module. The new compartment will serve as an extended docking compartment, providing needed clearance between the Russian segment’s forward port and an American storage module scheduled for installation on the next shuttle mission later this year. The new module was loaded with 1.5 tons of American supplies and equipment for launch aboard Atlantis. The day after the Rassvet installation, Captain Bowen and Mr. Good will stage a spacewalk to begin replacing six 375-pound batteries in the station’s far left set of solar arrays. A final spacewalk with Mr. Reisman and Mr. Good is planned to finish up the work. Atlantis is scheduled to undock from the space station May 23 and land back at the Kennedy Space Center around 8:44 a.m. on May 26. Note……NASA is trying to possibly wring one more flight out of Atlantis as a last supply mission for the International Space Station sometime later this year…..